‘Keeper’s guns were too big for the armband. Barcelona goalkeeper Victor Valdes moved to clear up the controversy surrounding his snub of the captain’s armband during this weekends draw against Athletic Bilbao by claiming that his arms were simply too big for it to fit around, according to The Metro. The 31-year-old has been linked with a move away at the end of the season after declaring his desire to leave the club after 12 years with the Catalan giants and he caused a stir this weekend when he refused to wear the captain’s armband. When midfielder Xavi was replaced by Lionel Messi in the 58th minute of the game on Sunday the armband was passed to Thiago Alcantara to pass onto Valdes with neither Carles Puyol or Andres Iniesta on the field. However, Valdes appeared to snub the responsibility meaning that Messi, the substitute, had to stand in as skipper for the rest of the game. 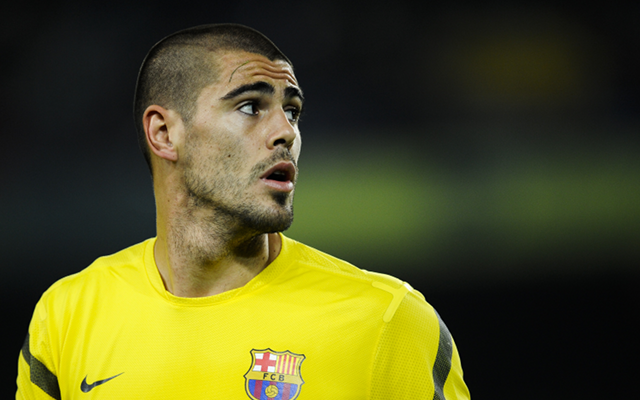 Valdes’ decision to reject the armband drew a considerable amount of criticism across a number of social media platforms but the Spanish international was quick to explain his reasons for the snub. “The assignment of the captain’s armband to Messi during yesterday’s game was for no other reason than because of a problem with size,” he said. With him seeming on his way out of the club it would be easy to paint the finger and claim that he shirked his responsibilities, or perhaps the club just need to invest in some bigger armbands. Barcelona drew the game 2-2.